I was a bit hesitant yet fascinated when I first started using Twitter. Now I see the form mature and I think microblogging is here to stay. 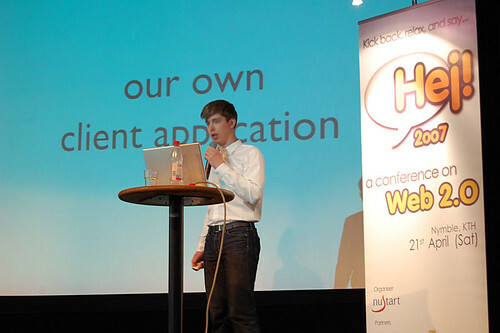 Since Hej!2007, which got me into Jaiku, I’ve been using the service quite a bit, and I am more or less migrating to it from Twitter, though I’m still sending the random update to Twitter. The great thing is that my twitters end up on Jaiku too. Here’s my brief comparison of the two services, and why I think Jaiku is so much more interesting and useful. It’s more social. The comments function makes it easier to interact with other users. You can add any feed. Jaiku can also contain your twitters, along with your recently played songs on for instance last.fm, your del.icio.us bookmarks, your blog headlines, your flickr photos, or anything similar. Just add an RSS feed and it will be scanned for updates. Jaiku has channels. You can create a more private group conversation by posting updates to a channel. Only the channel members see the updates – they don’t show up on the public timeline. This was used during Hej! 2007, for instance. Less technical problems. I’m quite frustrated with Twitter being slow or at times inaccessible. So far I haven’t seen similar problems with Jaiku. Let’s just hope they are prepared for a rapid growth in the number of users. Those are the key points why I like Jaiku. But there are others things that Twitter does a bit better. So far you can only get Jaiku in your cellphone if you have a Nokia phone, for instance (there’s a java version of Jaiku Mobile in private beta). And Twitter has more options for its web widgets. More people now read the Norwegian daily Verdens Gang on the net than read the paper edition, according to TNS Gallup. – It’s a milestone, says VG Nett editor Torry Pedersen to in an interview. VG Nett is now the largest news source in Norway. I think part of the success comes from VG’s strong reader focus. They started their blog services early, have a very active forum, and at Lesernes VG they bring all user activities together in an editorial context. The latest hit is of course Nettby, a user-created news site. Disclosure disclaimer: VG is Aftonbladet’s sister paper, with many collaborations between the sites. It’s great to be at Hej! 2007. Lots of cool people. 🙂 I’ll be updating this post live. Pardon for any misunderstandings and misspellings. My photos end up here. And here’s the Hej! 2007 flickr group. Quite a crowd has turned up for Hej! 2007. Beata Wickbom is today’s presenter. Erik Wahlforss and Alexander Ljung have been in San Fransisco researching the importance of trust in modern day internet companies. The theme of the presentation is Interpersonal trust online. – The big challenge is to focus on the social aspect, says Ljung. – Trust is a fine balance between being a super human with super knowledge and having no knowledge, says Wahlforss. Trust is a way of reducing the cognitive load on my brain. It enables me to focus. Wahlforss says that a basic trust, like trusting the people in this room, makes it easier to handle all the things you cannot or shouldn’t trust. They’re also speaking about limitations on conversations, relationships etc. and how you can look at them as limitations only, or as enablers. The exaple is the limit of a cash card being a good excuse for ending a phone call you want to quit without being rude, thus saving face. This is all in the ”real world”, of course, but it has online implications. 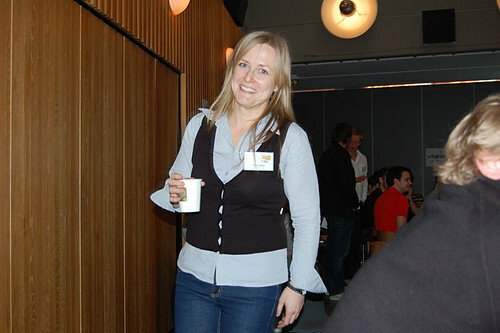 – There’s a fine core of trust in Wikipedia, Wahlforss says. You cannot apply a big system for managing the trust, because it might destroy the fine threads that keep it together. Joe Armstrong asks a question about the interaction between privacy and trust. – I think the attention trust in the US is getting is very good, creating awareness that people’s data is valuable. In order to trust anybody you have to have something to assess. If it’s completely private you’re like the guy in the white room, says Ljung. – The privacy certainly controlls the amount of trust cores. It’s up to the individual. Now Henrik Torstensson is entering the stage. He talks about statups, entrepreneurship the importance of liking what you do. Of thinking it’s fun. The magic formula of Stardoll is drag-and-drop, Henrik says. It’s more fun than to click on menues as on other dolls sites, according to Henrik. He also talks about building community sites. – The problem for small sites is that there won’t be many people there. So you need a ”single player mode” for your site. 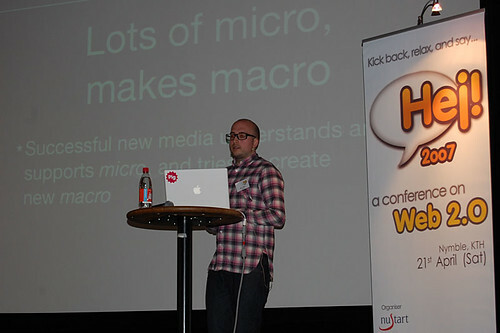 ”User generated content is the dullest buzz-word on the planet”, writes Eric Wahlforss on the Jaiku back channel. I so agree on that. Time for Andreas Ehn now, of Spotify, a music recommendation system launched in august 2006. It’s a streaming music service using a client application. – What we’re trying to do is bring back fun to music, Ehn says. It will be a free, advertising-based service. The broadband development and the change in the music and advertising industries, opening up to new models, is making it easier for Spotify. He points out the importance of feedback on web ads. – We’re trying to connect these dots, and we think that this change makes Spotify a necessity. If we don’t do it, someone else will. Questions were raised in the audience how they dare to invest in this, they’re not Jonas Zennström. – No but the people who funds it have some successes behind them, and they have lots of guts, says Ehn. – …and cash!, someone in the audience murmured. Lunch break now. Great sunny terrace, seafood wrap, fanta. I shared the table with Gitta, Malin, Erik and David. – I’m not used to this style of conference, it’s more like a religious meeting, says Joe Armstrong of Ericsson and also founder of Erlang programming language, first speaker after lunch. His speach is about choice of technology, and about being different. His point is that if you choose the same technology as everybody else you won’t be better. Your choice of progamming languages can thus be a commercial advantage. So why not take a chance and have fun. And if you turn out better you can make lots of money. After that it got too technical for me, but I’m sure someone else has better coverage. Björn Jeffrey coming up, talking about new media. Should be interesting. He’s woring with for instance Sydsvenskan’s establishment in Second Life. He thinks trust is the most important issue discussed so far today. Questions posed: Why does old media have to change its ways? How societal communication changes along with the current media shift. – Old media is not used to the internet, and not used to dialogue. This is difficult for media companies to handle. – Internet went from being a medium into being a carrier of media, Jeffrey says. This is the key point. He brings up new competitors from non-media companies. Craigslist, Blocket etc. – Dialogue pushes correctness. It has to be correct because someone will comment on it, and force it to be correct. It pushes the importance of knowing your reader. Also reader commentary creates a previously non-existing arena. Media companies have a big challenge in changing from gatekeeper to curator. 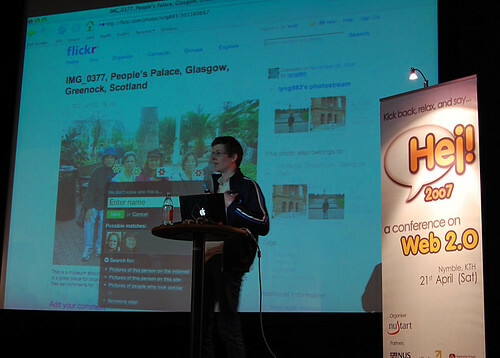 – The journalistic task should be to choose the blogs to connect to each issue discussed. He points out Twingly as a curating service. – Wifi is society’s back-channel. He brings up the term ”news narcissism”, in connection with the reporting done from the youth center in Copenhagen. That media created an image of what was going on that didn’t correspond with what people there were experiencing. Less connective tissue – people focus on different news, and might miss out on ”big” news in the traditional sense. Björn Jeffrey differentiates between macro information, like in what traditional media is good at, and micro information which is all the bits and pieces on blogs, social media sites etc. If you understand micro you can create a new macro perspective, Jeffrey says. Good point. And then he goes on to talk about old media’s revenge, their way of feeding the public’s urge for more – expanding a story. – There’s something to learn here. He also calls for balance, for there to be more than rants and raves in the reporting. And to dodge the ”attacks” by pr blogs, not falling for pr emails. And then there’s the importance of research. – Make that one phonecall. ”Is this true or not?”. Jeffrey also thinks bloggers need a code of conduct. – The challenge is to keep micro sharp and correct. A few last comments about Björn Jeffrey’s work with Second Life. – Why we helped Sydsvenskan enter is just as much an internal affair as an external – it’s a learning experience for them, to get the mindset right. We’re meeting up a lot of people who want to be a part of this island. Time for Jaiku, and Andy Smith. – I come here very much as a programmer, I’m not interested in money, he says. – We have a much larger feature set than Twitter. We’re trying to address a lot of the problems that they found while developing Twitter. 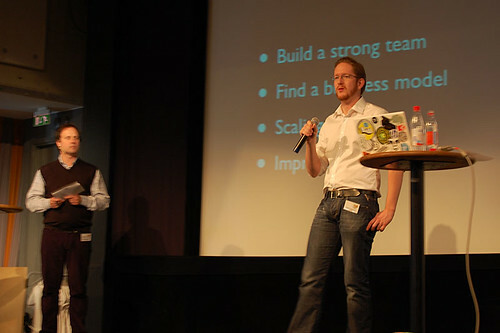 – Jaiku is about the little things that nobody really cares about, except the people that really care about you. Social sites should bring its users more beer, Smith argues. I think his point is that they should enable IRL interaction too. The way Jaiku facilitates this is by focusing on what people are doing right now. That makes it easier to meet up. The privacy issue was raised in the audience. Smith points out that you can filter who can see what. – We aren’t displaying nearly as much data as we get. It’s not meant as a data collection service. We’re not doing analysis on it at the moment. We’d like to, to create new features. So where is Jaiku heading in the future? – I’d like to get it to do more stuff with locations. Passive updates are great for that. Connecting to the physical world. Tram times, for instance. – You’ll be able to upload tracks you listen to on the phone, becasue we think that’s cool. Coffee break. HUGE pieces of cake. Gitta, Malin and I share one. Nikolaj Nyholm of Polar Rose enters the stage, and will talk about bionic software. He’s a big fan of open source. 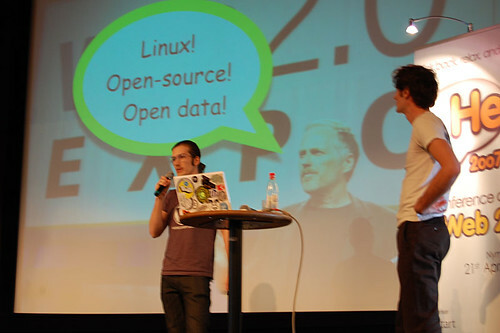 – The software has been commoditized by open source. There isn’t any commercial software that doesn’t have an equivalent or better open source software. – The new paradigm is about shipping services. The part that mattered was whether or not users could embed themselves. 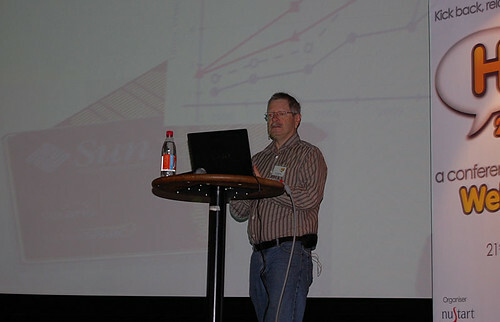 I heard Nyholm talk on Sime, where he got into a lot more detail about the Polar Rose software. Would be interesting to get more details, but he’s talking a lot about other services. What Polar Rose is is a photo recognition system that is based 3D modelling combined with the strenght of social media. – Computer face recognition is about pattern matching. If you change your pose it doesn’t match. That’s what 3D modelling is to take care of. The software finds matches based on face patterns. When the algorithms aren’t enough, users come in. – What we see is a fantastic addiction among about 60 percent of our users. They want to be the first to lable each photo they see with a correct name, Nyholm says. The software also works with video. – No data is stored in the US, ever, Nyholm says, getting laughs from the audience. – There are issues about the internet making public space very public. This is spreading without you or me being able to control that. It is both wonderful and a dilemma. We need to take a debate about it. Time for presentations of some startups. JayCut, GroupSwim, Podesk. They were two minutes each, so you’ll just have to look them up. 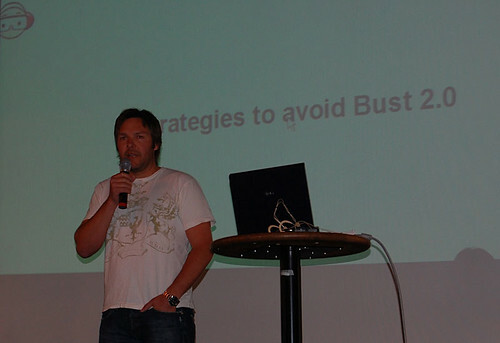 The theme of the presentation is Strategies to avoid Bust 2.0. – First off, I don’t think there’s going to be a new crash, but I think there are many similarities between the end of the 90’s and right now. There’s a lot of hype, says Arvin. He points out three key things that you need to succeed as a new company. You need a demand for your product or service, you need to be able to build it well, and you have to beat the competiton by executing well. – Focus on creating user value. If you don’t, you won’t make it. 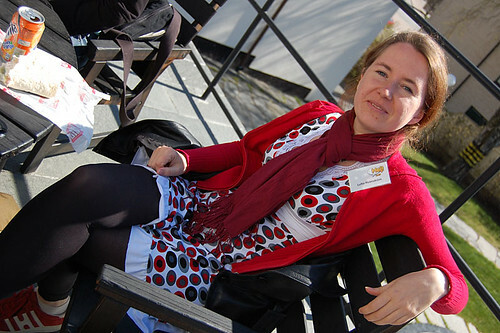 There are now 57 photos in my Flickr set for the conference. Back to Kristofer Arvin. He’s talking about differences between web1.0 and web2.0. – When you start focusing on the buzzwords instead of building the business, you can get into trouble. Then he admits he’ll soon be using some of today’s buzzwords when presenting his new project. Testfreaks is the name of the new venture wich will launch this summer. It’s about finding the best product based on your personal preferences. – We have really high ambitions this time. We are building the next generation buying guide. They’ll aggregate and analyse content with the help of users. Enter Johan Staël von Holstein with his son Nikolas. – Most of you guys were his age when I built Icon Medialab. The other reason I bring him here is that it builds his social skills. The citizens are creating all the content and the old media companies are making all the money, is how SvH define web 2.0. He sees web3.0 as the next step, where the content producers will make money from their content. – The potential is so big that you cannot even understand it. – Iqube is a system and a process to facilitate and help entrepreneurs in the early stages. You considerably increase your chances of becoming a successful entrepreneur within Iqube. – Almost everybody is going to look upon themselves as a media company. He has 80 companies in his portfolio. – One is going to beat Myspace, one will beat YouTube, one is the western world’s reply to OhMy News. The future’s so bright I have to wear shades. Time to round off. The organizers are entering the stage. They seem pretty pleased with the event, and rightly so. – You guys are just so cool! And here comes the promise of cheap beer. And of course mingling. Great. I think it’s time for me to end my reporting. Thanks for stopping by. Tomorrow’s Hej! 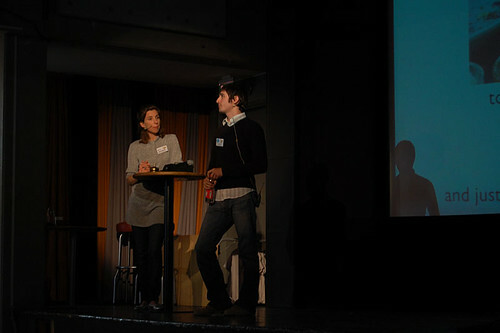 2007 conference in Stockholm will focus on web 2.0. I’ll be attending the conference and will try to blog as much as I can, live, in texts and photos. Whether on this blog or on my personal blog will depend on how much relevance the subjects will have to citizen media. The photos will probably end up on my Flickr account. We don’t want it to be some stuffy old seminar where everyone sits for hours on end. We want people to talk, walk, mingle, laugh and cheer. Oh. And we really don’t like suits. Jeans are cool. So leave your suits at home and bring that laptop and a healthy dose of enthusiasm and cheer! Here’s an article in Swedish on Hej! 2007 and the importance of credibility and trust as users come more into focus online. Eric Wahlforss and Alexander Ljung are ”trust consultants”, and two of tomorrow’s speakers. They will talk about some of their experiences from a three month study trip in the US. Should be interesting. Here’s the list of all speakers. In a country with only nine million inhabitants, the virtual world Habbo having 2 098 571 registered characters is quite an accomplishment. Habbo is a community for teenagers where you create virtual characters that inhabit a world that is compared with a virtual youth center by Habbo themselves. If Habbo was a town it would be bigger than Stockholm, thus becoming the largest city in Sweden. Habbo is also growing globally. Today there are more than 76 million virtual Habbo characters worldwide. This can be compared to Second Life which has around 5,3 virtual inhabitants. The reason behind the fast growth is a continuos creative development of the community. All the time new activities are added, which are exciting, informative and fun. Among the activities mentioned is a guest appearance by Swedish singer Darin and q&a with representatives from the youth section of the Red Cross. 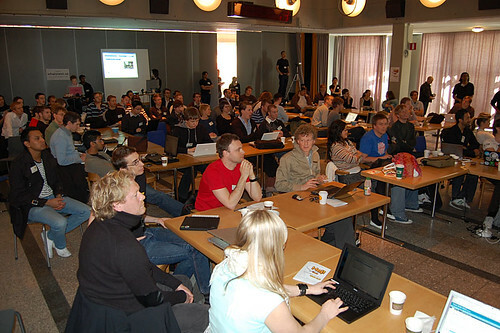 Anyone who can make it to Stockholm on June 12-13 should check out PodCamp Europe. 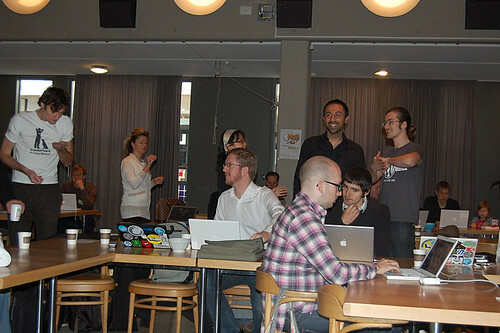 I’m quite excited to hear about what is most likely Sweden’s first unconference. The concept is that the knowledge stems from the audience, so everyone is a potential speaker. And yeah, the event is free! I’ve registered and really hope to make it. What is PodCamp Europe? It’s an UnConference of podcasters, bloggers, and new media professionals & amateurs for two days to share, explore, challenge, and grow our abilities in new media. Learn about audio and video podcasting, blogging, photography, Second Life, Twitter, and all kinds of other new and social media tools. Whether you’re a veteran or interested in getting started, PodCamp is for YOU. Next month the ground-breaking South Korean citizen media site OhMyNews will relaunch as ”OhMyNews 2.0”. The new site’s aspiration is to attract 100 000 volunteering contributors (today: 43 000) within the next three years, writes Dagens Medier. I’ve been off on vacation in Italy and the UK (hence no activity on this blog), and twitter has proved to be a good tool for keeping myself updated on what my friends and acquaintances are up to, as well as a way of updating them on what I’m doing. It was fun to get mymarkup’s instant impressions from South Africa while posting mine from Cinque Terre, and at the same time get reports from hlantz’s shopping excursions in Amsterdam and belo’s lunch plans. Using twitter at home is fun, but while travelling it comes to more use. Just my five cents on that. And to let you know that I’m back. Tomorrow I’ll start blogging on Bloggvärldsbloggen in Swedish. I’ll try to keep these two blogs separated, but an excuse for possible double-posting might be in place even before I start out. There is only so much time, and I want to keep them both active, along with my personal blog and Skriva.